What equipment do I need to take a photograph of my miniature-model? Of course you need a camera, and able to operate it, at least, pressing the shutter button. There are so many fully automated cameras out there, which will be able to do all of necessary settings for you. The camera will automatically focus the image, set the correct exposure, and even automatically trigger the flash whenever necessary. Then why not everybody were able to produce good pictures of their models anytime? That's where the story starts. A camera is just a tool to take picture. It does not have brain (although it may have embedded computer which can automate some of its functionalities), although it may be able to give you a sharp and well exposed picture, the so called “technically good” photograph, but it can not create a good composition for you. However, producing a “technically good” photograph is only half of the story, the other half depend on the photographer, the brain behind the camera, to create appealing image. The first question you may ask probably: "What kind of camera should I use?" To be able to get a nice picture of your miniature-model, your camera must have a macro-capable lens. Nowaday there are many compact digital cameras with such lens, you do not need to own a SLR camera with dedicated macro lens, unless you really need a top-notch quality for professional purposes. But before you purchase a compact camera, it is better to test its macro ability: set the camera to 'macro function' (usually it is a button with flower icon), then set the lens to its longest (maximum zoom). With that settings, try to determine the nearest point where the camera still be able to lock the focus (how close the camera will be able to focus on its longest zoom). Compare several camera models using the same method, and choose the one with the shortest focusing distance or highest object-magnification ratio. 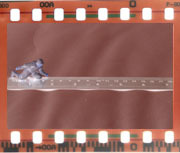 The above method will not exactly determine the macro ability of a camera, but it is the easiest way for a layman to choose a camera for miniature-photography purposes. Other features which you may need are: manual focusing and external flash connection. Ok. I got the camera, so what else now? 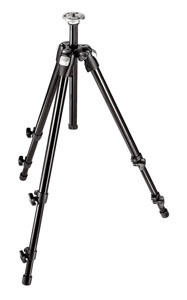 You will need a tripod. Of course you may be able to handhold the camera, but in macro photography, the risk of blurry image caused by hand-shaking is quite significant. Therefore as a rule of thumb; all macro photography should be taken using a tripod whenever possible, unless if the picture is taken in high shutter speed or the light source is provided by a strobe (flash) only without any other sources. 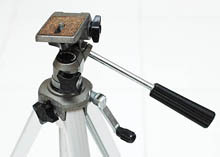 In purchasing a tripod, you have to find one with sturdy feet, the one which will not vibrate or wobble if you press the camera's shutter. 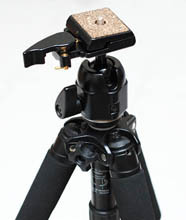 There are two common types of tripod head: the pan-head (picture below, left), and the ball-head ( below, right). Both are good for photographing miniature-models. The ball-head will give a slightly more convenience since it uses a single locking knob as compared with three knobs on the pan-head. But the ball head will cost higher than the pan head. That's all you need; a camera with macro feature, and a tripod. Other than that, you may need one or two strobes (flash), but it can be substituted by shooting under natural light. Some other accessories can be easily made up along the way, such as: background paper, reflector, etc. We will talk about that in the next chapter. As for now, just read the user manual of your camera and make sure that you are able to set the macro function, disabling the built-in flash, and setting the aperture manually. A macro photo will ideally be shot using small aperture (higher aperture-number) and low ISO number. For those who prefer to use SLR camera with interchangeable lens, please make sure that your lens is able to do macro-focusing with an image reproduction ratio of greater than 1:5. The "true" macro-lens will be able to produce a 1:1 reproduction ratio, which means that the size of the projected image in the camera's sensor will be exactly the same size as the object itself. 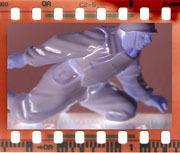 A 1/35 scale figure was photographed using 1:1 macro lens on film and digital-SLR with 1.5x crop factor. The bottom two pictures show the same figure was taken using 1:5 macro lens. Note the difference: the 1:1 macro lens allowed a much closer image than the 1:5.